There’s no CS-based Christmas story this year (boooooo!) because most of the year has been spent finishing, publishing and promoting the (CS-based) novel (hooooray? – maybe not!). So instead, here are some links to previous years’ offerings and an entirely unsubtle suggestion for a Christmas present! In 2014, we first encountered the Travelling Santa Problem, in which Father Christmas was introduced, by his ‘decision elf’, Boz, to the magic (non-deterministic) reindeer, Rudolph. Together they figured out the best way to deliver presents to all the children in the world. 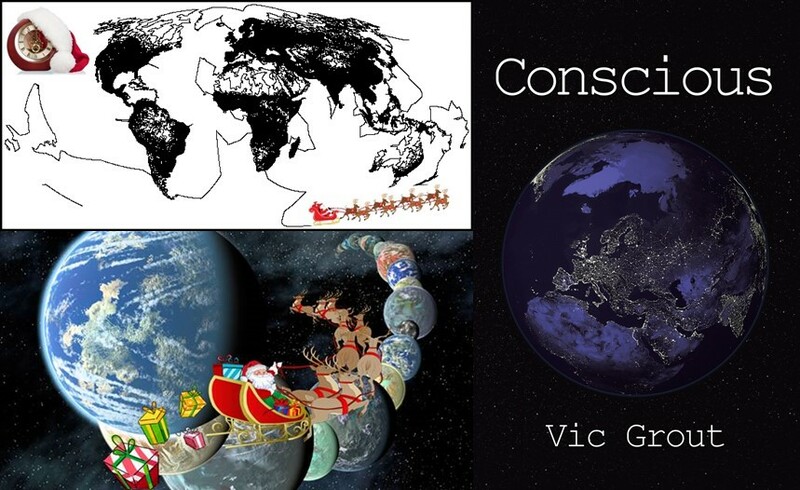 Then the following year, 2015, Father Christmas was given a whole load more (in fact, an infinite number of) planets to deliver to and he needed the help of Rudolf’s ‘countable’ Russian cousin, Nureyev, in Santa in the Continuum. If you haven’t read them before, or you fancy a bit of light relief, give them a (re)read! Prices vary from £6 to £7 for the eBook up to around £20 (including postage) for the paperback. But whatever you choose to read or not read, MERRY CHRISTMAS! This entry was posted on Thursday, December 1st, 2016 at 10:08 am	and tagged with Christmas, Conscious, Novel, Santa, Science fiction and posted in Computer Science, General. You can follow any responses to this entry through the RSS 2.0 feed.